Running mates: What's going on with Apple and Nike? Apple and Nike: Making sweet technology together? Apple's partnership with Nike is like no other. Sure, Apple teams up with manufacturers, retailers and mobile networks all the time. Willing firms like Yahoo and even rivals like Google supply core services, auto manufacturers are baying to integrate CarPlay and accessory makers clamour for that 'Made for iPhone' certification. But with Nike it's different. It's just… tighter. The two American powerhouses are the Brangelina of the tech and business world: made to bask in each other's respective glories. Since 2006 we've seen an abundance of joint launches, which for Apple is rarer than rocking horse poop. Meanwhile Nike's fitness software was baked-in to Apple devices long before that became the done thing. Apple has added key Nike figures to the payroll in the last couple of years and, heck, Apple CEO Tim Cook has been on the board of directors at Nike for almost a decade. It all started, at least publicly, back in 2006, when Nike joined Apple at an event in New York to announce Nike+iPod. Thanks to a special pair of Nike Airs, with a compartment within the sole for a thumbnail-sized sensor, running shoes were now able to communicate with MP3 players. The sensor featured an accelerometer, which tracked how long the foot spent on the ground, while also recording the number of steps taken. Combined with the timer on an iPod nano, runners could get accurate speed, distance and calories readings, all while listening to their favourite tunes and receiving regular voice updates on the progress off their workout. Plugging the iPod nano into iTunes via USB saw all data was synced back to the Nikeplus.com online portal where runners could track performance and goals over time. Steve Jobs called it "like having a personal coach or training partner motivating you every step of your workout" and it became the foundation of everything we expect from a fitness tracker today. A couple of years later, the app arrived on the second-generation iPod touch (2008) and the iPhone 3GS, allowing wireless transmission of data. The tech was even built into specialist gym equipment. 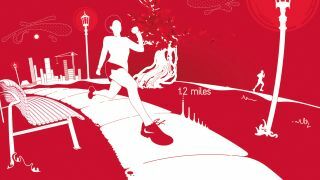 In 2010, the firm released the standalone Nike+ GPS app for iPhone (Now Nike+ Running) which combined location tech and the phone's accelerometer, allowing users to ditch the sensor altogether. As of today, Nike is nearly as big a part of the iOS ecosystem as built in apps like Weather, Stocks, Clock and more. However, just lately, rumblings have suggested there's some bigger brewing beyond Nike powering the iPhone's health conscious side. Reports over Easter revealed Nike had fired the majority of employees working on FuelBand fitness hardware in order to focus on software, potentially adding a new twist to this intriguing friendship. Why would Nike exit the buzzworthy wearable sector, when it's the fastest growing in both the fitness and the technology industry? Unless it has bigger plans afoot. Unless it plans to leave the hardware to a specialist and a friend like, say, Apple. Next Page Apple and Nike: Making sweet technology together?